I like to think that I've become a bit more open minded when it comes to different styles of cloth nappies the second time around. Different styles work for different parents and different babies which is why I was really excited to try out the new Itti Bitti Tutto all-in-one nappy. 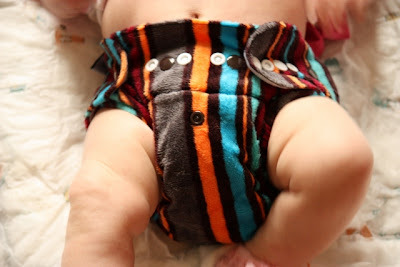 Itti Bitti is the very first brand of cloth nappy that I ever heard of and the only one that I knew before I became an expectant parent but until now I had never tried any of their nappies. 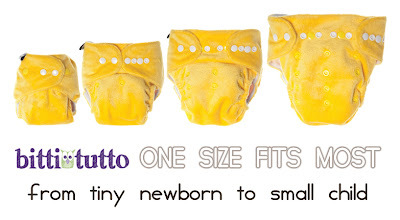 The Itti Bitti Tutto is designed for use from birth right the way up until potty training. It uses a series of snappers to alter the length and width of the nappy as your child grows. 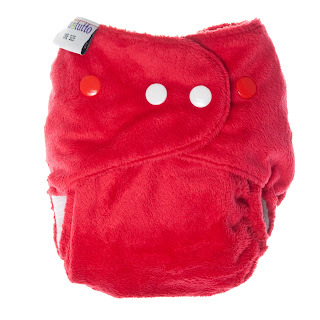 On the outside there is a gorgeous and fun fluffy fabric but on the inside where the series business of absorbency goes on it is made from stay-dry suedecloth to try and keep your baby's bottom dry. A series of different snap-in boosters are used to alter the level of absorbency needed. I loved the fluffy fabric of the Itti Bitti nappy, it really makes it stand out from the other nappies in my collection but the fluffiness did diminish a touch after the first wash. I found that I needed to pre-wash the nappy a lot before it was able to offer a level of absorbency I was happy with (I think about 8 washes). I also find the Tutto nappy to take the longest to dry of all of my cloth nappies. I really like the shape of the Tutto nappy as it sits against Holly's bot - it is nice and tight around the legs without seeming to restrict her movement. The design of the inside of the nappy is unlike anything else I have seen - it has a raised edge which they call their 'poo fence' which really does seem to work to stop wet tiny baby poo leaking out. The number and shape of the different snap-in absorbent layers bamboozled me a bit and I'm still not sure that I have entirely settled on the right combo for us but I would imagine that Holly's needs will change as she grows and I will have to re-learn which pieces to use inside the nappy. You can get the inserts in microfibre or bamboo - we use bamboo and they tend to take longer to dry but I believe give a better absorbency level. Due to the time it took to build up a good level of absorbency in the nappy, I haven't been brave enough to try the Itti Bitti Tutto at night time yet - I should do one day really though to see if it is up to the challenge. 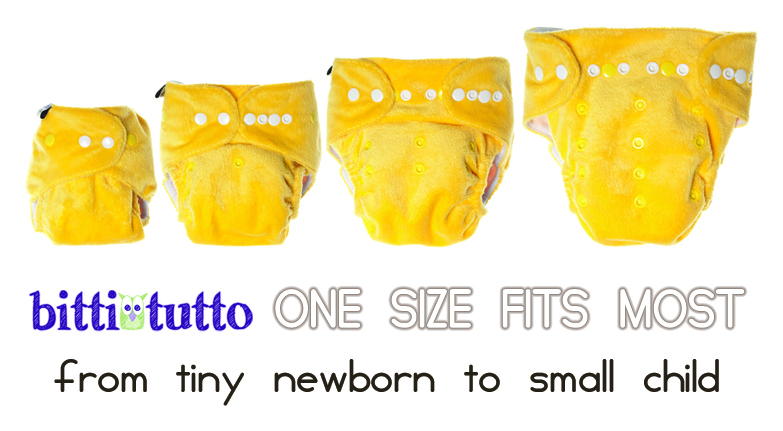 One of the things I like best about the Tutto nappy is that there is one extra snapper right back by the hips that allows you to really make sure that the nappy is tight all the way around a small baby's waist. This is an area where many other all-in-one and snapper-based nappies can struggle. As Holly grows older, we probably won't need to use this extra snapper but at present it prevents the 'wings' from working loose. If I were to give the Itti Bitti Tutto a mark out of 10, I would go for a 7. Cheeky Baby Tees Review - STOP sniffing my bum! Have I brought up a monster?